Create My Cookbook refers to CreateMyCookbook, LLC and who is doing business as Create My Cookbook. You can visit the Site and see what we do there without providing personal information. However, to create books or use other interactive features, you will need to provide personal information. By registering as a user, you will be able to submit recipes and photos, create cookbooks, order printed books, communicate with other users, leave feedback or otherwise take part in the interactive features of the Site. As part of registration, we collect your name and e-mail address. We use this information in order to carry out your transactions on the Site and for other Site-related communications. If you place an order with us, we may ask you for your a billing and shipping address to allow for processing and delivery of your order. If you choose to receive our newsletter, we will send you updates about Create My Cookbook and the Site, as well as special offers. We may ask for other information about you in order to customize your website experience or perform other internal analyses to improve our services or the Site. We indicate at the time of collection which information is mandatory and which information is optional to provide. We may ask you to provide personal information in order to allow us to respond to your requests for information or other requests made over the Site. Purchases of Products and Services. Where the Site allows you to purchase products or services online, we collect your credit card or other payment information in addition to your name, address and other identifying information. Users may invite a friend to join Create My Cookbook or to submit recipes or photos or book design ideas by using our Invite a Friend feature, which permits users to enter their friends’ name and e-mail address in our system. We then send your friend a one-time invitation to visit the Site and join Create My Cookbook. We store this information for the sole purpose of sending this e-mail and tracking the success of our referral program. If your friend would like to be removed from our system, he or she can send an e-mail request to privacy@CreateMyCookbook.com. We collect non-personal information such as your Internet browser type, operating system, and the IP address of the website from which you are linked to our website. We use this information to help us tailor our website in a manner to better match your computer settings, interests and preferences. We may also use your personal information to help us develop new services, to verify your identity, to communicate with your about your account, to collect debts owed to us, to investigate or settle inquiries or disputes, and to customize your experience with our company and our website. What Are Cookies and How Does Create My Cookbook Use Them? Please be aware that users must have cookies enabled to use the Site and take advantage of its interactive features. Each registered user of Create My Cookbook can set their preferences for the e-mail Alerts they wish to receive. You can edit your e-mail preferences at any time by visiting your profile under “Settings” once you are signed in. You will not receive promotional e-mails or mailings concerning Create My Cookbook or its services unless you specifically elect to receive such information. 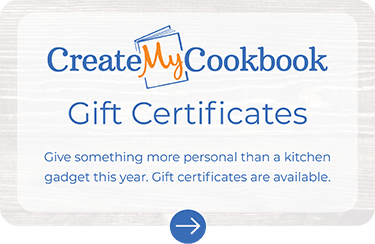 At the time of registering as a Create My Cookbook user, you will be given a choice whether to receive promotional e-mails from us, and you can change your choice later by updating your profile. Each promotional email you receive from us will provide you a specific opt-out mechanism to allow you to unsubscribe from receipt of these promotional e-mails. Even if you choose not to receive promotional e-mails from Create My Cookbook, we may continue to use your e-mail address in order to carry out or communicate with you about transactions you make on the site, or to send Alerts that you have requested in your profile. Create My Cookbook will not sell, rent or share your personal information with third parties without your permission, except as necessary or appropriate to (i) carry out transactions you make on the Site, (ii) respond to your requests or answer your inquiries, (iii) comply with any applicable law, court order or other judicial process, or to protect Create My Cookbook or its users from liability, loss or harm. In the event of a corporate transaction such as a sale or merger involving Create My Cookbook, personal information may be transferred to the purchaser. Create My Cookbook may collect and share aggregate website statistical information (such as sales, traffic patterns or related information) with third parties, but no such aggregate information will contain information that could be used to identify you. Your e-mail address will not be shared with other users unless you post it on a public space on the Site, send it to another user or give us permission to share it. Create My Cookbook may also post on the Site certain user information, such as geographic breakdowns of users or statistics broken out by user handle, but we will not post any information that may be used to individually identify you without your permission. Please be aware that any information you enter in your public Profile will be visible to all users. Create My Cookbook may occasionally hire contractors to provide certain services on its behalf, including IT services or information processing. These contractors are required to maintain the confidentiality of the information and are restricted from using the information for any purposes other than those authorized by us. We employ and maintain technology and security measures designed to protect your personal information. When you submit sensitive information via our website, such as credit card information, that information is subject to a variety of protections both on-line and off-line, including password-protected systems, firewalls and secure sockets layer (SSL) encryption technology. However, no data transmission over the Internet can be guaranteed as 100% secure. As a result, while we strive to protect your personal information, we cannot ensure or warrant the security of any information you transmit to us or receive from us. The Site is not intended for use by minors or children under 13. We ask that children under the age of 13 do not use the Site and do not submit any personal information to us.